Well, after more than a month of posts, I think it's time to wrap up my recent series about milk. As I said in the introduction, if nothing else, I hope this series encouraged you to ask questions and research things. We wouldn't be where we are today as a society if the great literary, scientific, religious, and engineering minds of the past hadn't questioned the norm. 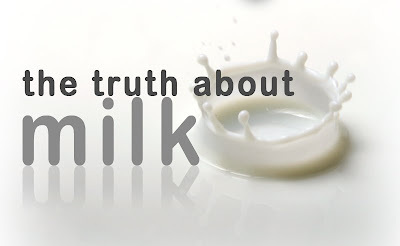 The very fact that milk is pushed so hard by government agencies, schools, etc. should make us ask "why?" Why is this seemingly simple product advertised so heavily? Why are so many people allergic to it? Why are we told that we can't be healthy without it? The truth of the matter, as we've covered over the last 11 posts, is that milk is unnatural and dangerous. Humans are the only creatures on the planet that drink milk from another species. We are also the only creatures that drink milk beyond infancy. Drinking cow's milk is an unnatural and foreign concept. It is also dangerous, with a wide range of health risks. Everything from heart disease to allergies, to behavioral problems can be linked back to dairy consumption. It is especially dangerous for infants and children, who's bodies are still developing. Babies who grow up on milk-based formulas are at risk for any number of adult diseases. In conclusion, milk and dairy products should be avoided. I would argue that they should be avoided at all costs. Once you make the commitment to avoid dairy, you'll quickly realize how easy it is. Things like cheese and ice cream, which may seem like dietary staples, are surprisingly easy to forget and the health benefits are worth it. Your body will thank you for it, as will your children. My daughter is 4 months old and has never had cow's milk of any kind. If I have anything to say about it, she never will. Her body is still developing and is dependent on us for health. How can we justify compromising the health of someone so helpless? We owe it to her to provide the absolute healthiest lifestyle possible until she is old enough to make these dietary decisions herself. I am aware of how many people read this blog. If any of you phantom readers have any questions, feel free to ask. But ultimately the decision is yours. All I ask is that you ask questions and make an informed decision.